Dr. Seuss, The Cat in the Hat. It’s Mr. Geisel’s birthday, so I thought I would repost this in celebration of our beloved author. Enjoy – with a slice of green cake. 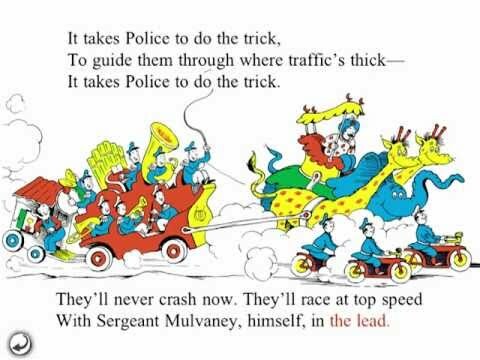 This may be hard to believe, but I did not read Dr. Seuss as child. I didn’t read him at school I didn’t read him at home. I bet by now, you think I’m a gnome. For whatever reason my mother did not introduce me to Dr. Seuss. By the time I picked up one of his books my reading skills had advanced beyond childish “nonsense”. It wasn’t until I became a parent did I finally learn to love and appreciate his work. My memories of Dr. Seuss come the hours I spent reading to my child. My favorite Seuss book is The Lorax, with The Sneetches a close second. My son loved them, so much so that he learned to read at an early age just so he could enjoy them over and over again. To honor the many and the memories I have of his stories I thought I would share 11 things you may not know about the beloved author. Dr. Seuss’s real name is Theodore Geisel. Theodor Seuss Geisel was born on March 2, 1904, in Springfield, Massachusetts, to Theodor Robert Geisel, a successful brewmaster, and Henrietta Seuss Geisel. At age 18, Geisel left home to attend Dartmouth College, where he became the editor in chief of its humor magazine, Jack-O-Lantern. Geisel threw a boozy party during the height of prohibition and got kicked off the magazine. He needed a pseudonym to keep writing for the magazine so the name Suess was born. He actually pronounced “Seuss”, Soice, which rhymes with voice. After returning to America with his young wife, Geisel pursued cartooning full-time. His work included articles and illustrations that were published in numerous magazines, including LIFE and Vanity Fair. A cartoon that he published in the July 1927 issue of The Saturday Evening Post, his first using the pen name “Seuss,” landed him a staff position at the New York weekly Judge. He moved on to work for Standard Oil in the advertising department, where he spent the next 15 years. 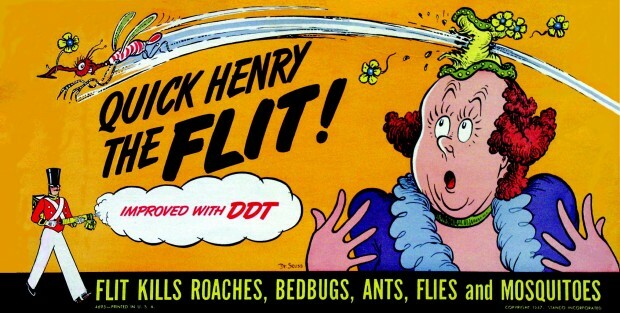 His ad for Flit, a common insecticide, became nationally famous. Dr. Seuss’ first book, And To Think That I Saw It On Mulberry Street, was initially rejected by over 20 publishers before finally being picked up by Vanguard books in 1937. Though he went to write more children’s books like, Horton hears a Who, Seuss did not reach commercial success until late in life. In response to a 1954 LIFE magazine article that criticized children’s reading levels, Houghton Mifflin and Random House asked him to write a children’s primer using 220 vocabulary words. The result was Seuss’ The Cat in the hat. And the rest as they say, is history. Sadly, Seuss’s personal life was not as simple as his books. Seuss has no biological children. In October 1967 Seuss’s wife Helen, suffering from both cancer and the emotional pain caused by an affair he had with their longtime friend Audrey Stone Diamond, committed suicide. Seuss married Audrey the following year. 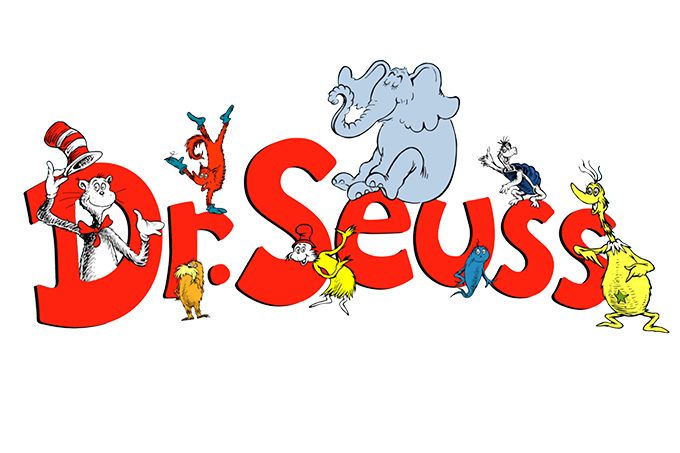 Dr. Seuss died in his sleep on September 24, 1991 at the age of 87 after a prolonged bout with jaw cancer. Although a Geisel Library and Dr. Seuss National Memorial Sculpture Garden have been opened in his honor, his wife Audrey, honored his wish to have no grave or marker signifying his final resting place. I once read that he had a deep fear of children, as well. Though that could certainly be untrue. Don’t forget his wartime political cartoons, documented in “Dr. Seuss Goes to War: The World War II Editorial Cartoons of Theodor Suess Geisel” by Richard H. Minear. No, I didn’t see that in my research! Thanks for mentioning this. Remember to breath my friend, breath! I vaguely remember Dr Seuss when growing up as a child — didn’t some of his work appear as syndicated cartoons, or is that my imagination? — but, as with you, my main acquaintance with his work came from bedtime reading with our children (and now grandchildren). Green Eggs and Ham was the family favourite, Hop on Pop helped with reading, and The Lorax packs an ecological punch. By the way, hated the feature film of Cat in the Hat (switched off feeling slightly sick) and have avoided Horton and The Grinch as a result. Similarly, have no desire to see Where The Wild Things Are — much prefer the animated short of that, based on the late Sendak’s original book illustrations, and especially In the Night Kitchen. By the way, have you found that WordPress has been deleting links with some blogs you follow? I had to re-“follow” you when I spotted in the Reader that I might enjoy your posts, and that’s applied to at least one other followed blogger — anxious about the rest now. I am with you. The Cat in the Hat was dreadful ! I haven’t watched the others. I did not see any mention of work in syndicated cartoons, but I missed his war efforts so who knows what else I may have missed. Yes, I noticed I had to re-follow some people. I have also noticed that some of the blog I follow have broken links. Not sure what’s up with WordPress. Next Next post: Dear Prudence, are we being punked?